One flight attendant...eleven Looney Tunes characters...GO! Passengers on a Southwest Airlines were treated to a very animated announcement when they landed in Chicago last week, after one perky flight attendant took the opportunity to show off his impersonation skills. Zach Haumesser nailed impressions of nearly a dozen characters from the classic Warner Bros. cartoon series "Looney Tunes" as the plane prepared to touch down in the windy city, much to the delight of travellers. Beginning with Elmer Fudd he then seamlessly transitioned into an uncanny Bugs Bunny impression, even giving a shout out to a university football team — who were on the plane — whilst still in character. Reimagining himself as Daffy Duck, he put on his best lisp as he asked passengers to remain clear of the "doorth" for their "thafety," and reminded them to "please, I say, please" check their connecting flights as Yosemite Sam. Haumesser also showed off his impersonations of Porky Pig, Sylvester the Cat, Tweety Bird, Pepe Le Pew and the Tasmanian Devil in the spontaneous "Looney Tune" mash-up. 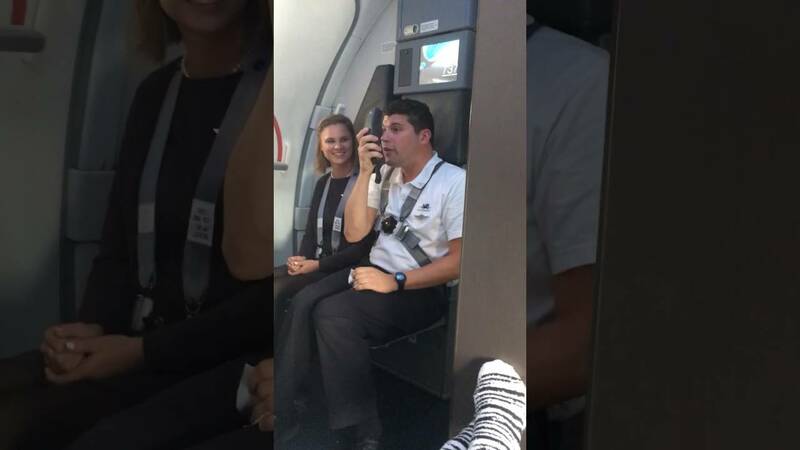 Of course, the video soon went viral after co-worker Jordy Elizabeth captured the seamless routine on video and uploaded it to Facebook with the caption: "This is just one of the million reasons why I LOVE my job." Since then, the video has racked up more than 655 shares and over 110,000 views on the social networking site, and over 1.4 million views on Youtube in just a few days. And on that note... That's all folks!